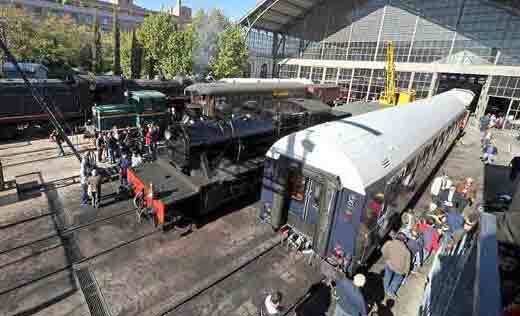 The Madrid Railway Museum (Museo del Ferrocarril de Madrid) opened its doors to the public in 1984. It is located in the former station of ‘Delicias’, one of the finest and most representative examples of Spanish industrial architecture, which was inaugurated in 1880. The museum contains a selection of vehicles and other railway-related exhibits which aims to show the historical evolution of this mode of transport. Its fundamental purposes are to convey the reality of the railway, both past and present, promote an appreciation and understanding of rail transport, encourage railway-related research and enhance the railway heritage, all in the spirit of public service. The recent opening of the Railway History Archive and the Railway Library Consultation Room, as well as the conservation and constant expansion of the Photographic Library, have greatly contributed to the achievement of these objectives. The Museum offers the visitor an impressively comprehensive collection of vintage rolling stock. 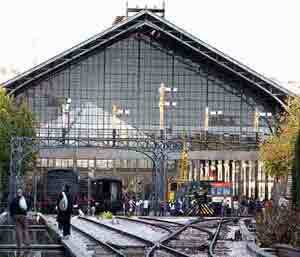 The station’s Central Hall houses a diverse range of locomotives and passenger coaches, which not only illustrate the development of traction (steam, electric and diesel) over more than 150 years of Spanish railway history, but also provide an insight into the different conditions in which passengers travelled on these trains. Both sides of this central area open on to several themed exhibit rooms devoted to old station clocks, model railways –featuring working scale models– and railway infrastructure, where basic constituent elements, such as the track, are explained. On the outer tracks the visitor will find the Algodor interlocking and its signal bridge, a unique part of our industrial heritage which, after entering into operation in 1932, was used to control point switching and signalling; and the museum’s cafeteria, installed in a 1930 restaurant coach. The Museum organises numerous activities and offers the opportunity to travel between Madrid and Aranjuez on an authentic vintage train, the Strawberry Train (Tren de la Fresa), during the spring and autumn months. It also hosts various temporary exhibitions and offers a wide range activities aimed at children and families, such as educational workshops and theatre performances, concerts, guided tours and several open days coinciding with International Museum Day or with various events related to the history of the railway, as well as a model railway flea market on the first Sunday of every month.